Manila Water recently bagged first runner up recognition for Energy Management – Building and Industries, Small and Medium Industry Category at the Asean Energy Awards 2018 for its N. Domingo Pumping Station. The Philippine Department of Energy (DOE) pre-selected the facility as one of the representative entries for the Philippines. Manila Water is the sole corporate winner from the Philippines in this year’s awards. Photo shows Asean Secretary General H.E. Dato’ Lim Jock Hoi handing the award to Manila Water Energy Management and Innovations Department Head William Alcantara. 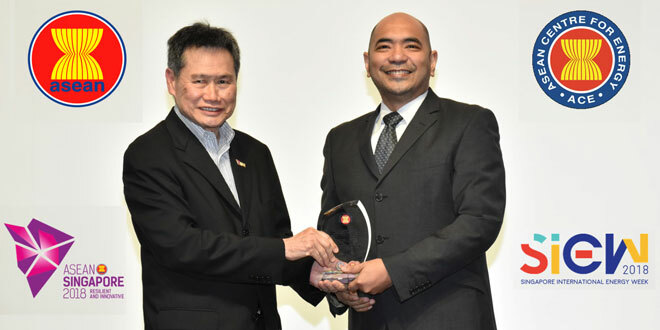 The Asean Centre for Energy awarded Manila Water first runner up recognition for Energy Management – Building and Industries, Small and Medium Industry Category at the Asean Energy Awards 2018, held during the recent 36th Asean Ministers on Energy Meeting in Singapore. The Asean Energy Awards aims to recognize organizations in the Asean member states that demonstrate exemplary programs and projects that contributed to improvement in energy efficiency and performance. Manila Water was recognized for its energy efficiency projects that contributed to significant savings, particularly for the N. Domingo Pumping Station. It was the Philippine Department of Energy (DOE) that pre-selected the facility as one of the representative entries for the Philippines. Out of 63 awardees this year, Manila Water is the sole corporate winner from the Philippines of 13 entries sent by the country. DOE Secretary Alfonso Cusi personally congratulated Manila Water at the venue right after receiving the award. Major highlight of the winning entry is “Project Lights-Out” initiated by the team of Fermin Cristobal, Plant Manager of N. Domingo Pumping Station. “This award demonstrated how every part of Manila Water is playing its part to improve efficiency and protect the environment. Project Lights Out shows that a project that started out as a customer service improvement project has multiple benefits,” said Thomas Mattison, Manila Water Corporate Operations Group Director. First held in 2000, the Asean Energy Awards is Southeast Asia’s highest recognition for excellence, creativity, practicality and dedication to a cause in the field of energy. It is an annual event organized by Asean Centre for Energy (ACE) in collaboration with the Asean Specialized Energy Bodies (SEBs).